There are certain food blogs that bring back memories of the food my Mom would make for dinner. One of those blogs is Memorie di Angelina. The writer's Nonna is from the Campania region of Naples. My Nonna was from the Benevento region. That is so exciting for me. I feel like the recipes on the blog are as close to cooking like my Nonna as I can get. 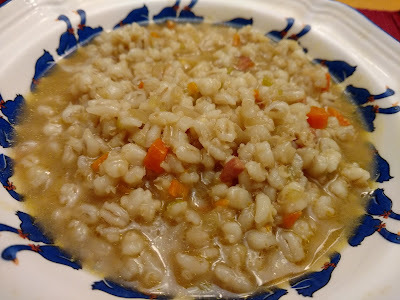 Tonight we had Zuppa di orzo (Italian Barley Soup). This is comfort food at it's best. Click here for the recipe. And spend some time reading through the other recipe s at Memorie di Angelina. You will be bookmarking quite a few of them.